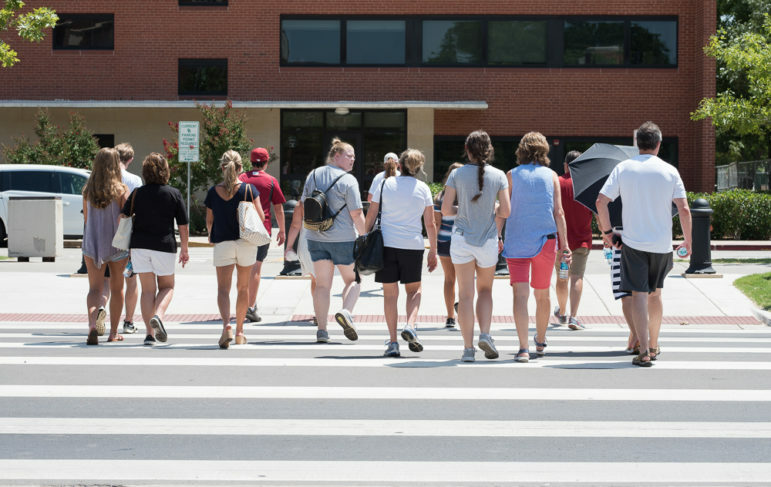 A student-led tour group walks on the south oval of the University of Oklahoma campus. OU conducts many such walking tours, including during the summer. Its recruitment of National Merit Scholars is more intensive and personalized than for most other students. For decades, the University of Oklahoma has been recruiting and heavily investing in National Merit Scholars — academically advanced students who score in the top 1 percent on a standardized test. Former President David Boren was the biggest champion of the university’s feat of enrolling more National Merit Scholars than any other college, giving them tuition waivers and stipends for technology, housing and studying abroad. Over the years, OU has likely spent hundreds of millions of dollars to attract National Merit students, many from out of state, in an effort to raise the quality of students, recruit strong faculty and improve its academic reputation. Now that program is being scaled back. This fall, half as many National Merit Scholars, or an estimated 155 to 160, will be heading to OU as freshmen. The OU office dedicated to recruiting and retaining Merit Scholars has also been scaled back. The decisions were made at some point before Boren retired and James Gallogly replaced him on July 1. Erin Yarbrough, the university’s interim vice president for public affairs, said the changes were made to focus more on scholarship students beyond the Merit Scholars program. But the program’s decline means OU could lose its biggest academic bragging point. For years the university has touted its number of National Merit Scholars in full-page newspaper ads, television commercials and during halftime at football games. Boren has promoted the fact that OU has more Merit Scholars than any other public university and, in three years, more than any public or private university, including Harvard and Yale. Despite the ranking, the university provided little public data on whether the program was achieving its broader goals. Some higher education experts are critical of that type of merit aid, saying it mostly benefits the affluent and reduces the scholarships for lower-income students who need the money more. Boren, reached through his former press secretary Matt Epting, declined to comment for this story. OU did not make any officials familiar with the program available for interviews and issued only emailed statements. Yarbrough said the documents about costs were internal budget records and weren’t immediately available. The university’s relentless pursuit of Merit Scholars dates back two decades and is a major part of Boren’s legacy. Students become National Merit Scholars by scoring high on the PSAT/NMSQT test in 11th grade. OU set up a dedicated office with four full-time staff members who went to great lengths to recruit National Merit Scholars through letters, phone calls, a special dinner and a tour of campus. In 2016-17, OU enrolled more Merit Scholars – 317– than any other university, according to the National Merit Scholarship Corporation’s annual report. The school enrolled 314 in 2017-18, Boren said at convocation, according to the OU Daily. Last year there were more than 850 National Merit Scholars total attending the school, the OU website says. The National Merit award is not a full ride, but covers many, if not most, of the costs. For 2018-19, OU estimated the value of the National Merit Finalist scholarship over five years at $64,000 for Oklahoma residents and $117,000 for non-residents. The biggest amount was tuition waivers. The awards this year have been slimmed down. The biggest change was that out-of-state students will now have to pay some tuition, owing the in-state rate minus a partial waiver of $2,000 a year. Also, a $4,200 freshman-year housing stipend was eliminated for both residents and non-residents, and the technology and study abroad travel stipends were reduced by $500 each, to $1,500. With the changes, the number of freshmen Merit Scholars this year plunged. Some prospects may have enrolled at other colleges with similar scholarships, such as in Alabama or Texas. 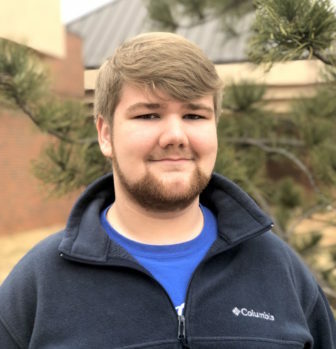 The current package, however, was attractive enough for Brian Carlton, a graduate of Edmond Santa Fe High School who achieved a perfect score on the ACT. Along with OU, he considered Oklahoma State University and the Massachusetts Institute of Technology. He’ll be a freshman at OU this fall. “It doesn’t cover every expense, but basically if everything goes well, I’ll be able to graduate without any student debt,” Carlton said. He said has been bombarded with mail from colleges since he took the PSAT and ACT, but OU was the only school that called, making him feel like they are dedicated to students’ success. “I appreciated that,” he said. Despite the cuts, the OU program still offers a significant benefit to students who qualify. But has it been a worthwhile investment on the part of taxpayers? The university said it spent $28.7 million on the program in 2017-18 and served 942 students. 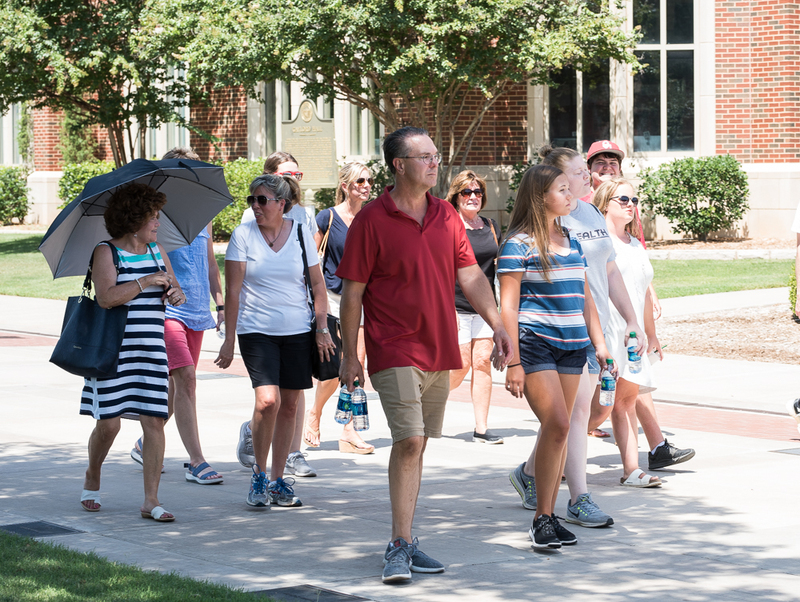 A tour group walks on the south oval of the University of Oklahoma campus on July 23. About 58 percent of the incoming students attending OU through the National Merit Scholars program are from out of state, Yarbrough said. That compared to 39 percent of the total student body, according to the National Center for Education Statistics. At the OU Board of Regents meeting in May, Boren said the Merit Scholars program brings in extraordinary students, and the majority have a 4.0 high school grade-point-average. He said they are a magnet to attract faculty who want to teach bright, talented students and they raise the aspirations of all students. He has previously credited the program with improving the university’s national ranking and attracting higher quality faculty. OU’s average freshman ACT score has gone up under his leadership, from 25.0 in 2001 to 26.5 in 2016, the university has said. The national average has hovered around 21.0 since the mid-1990s. Yet some say a cutback in the program is a good thing. “There are a lot of kids who I would see who deserve to get some scholarship money and that money wasn’t necessarily there,” said Schaeffer, the former Honors College official who is now director of college counseling at Heritage Hall, a private college prep school in Oklahoma City. Rural students who attend a school that doesn’t offer the PSAT exam are an example of those who are disadvantaged in competing in the program, Schaeffer said. She also said there are plenty of extremely bright students who just barely miss the cut-off and the scholarship dollars. Some see a problem with merit aid in general because it often gives funding to students who need it the least: those from wealthy families whose children would go to college anyway. “Taxpayer dollars … should go to folks who need those resources as opposed to rewarding folks for performance who may or may not need those resources,” said Bob Giannino, chief executive of uAspire, a nonprofit that works to improve college affordability. The only way for high school students to qualify for the Merit Scholars program is by taking the PSAT/NMSQT test. Test takers who score in the top 1 percent of each state are named semifinalists. Just 23 percent of Oklahoma 11th grade students took the exam in 2017. Affluent families are greatly over-represented because of the competition’s reliance on a standardized test score to qualify, said Bob Schaeffer, public education director for the National Center for Fair and Open Testing, which works to remove biases and flaws in testing practices. Those are the families who can also afford expensive test prep programs, he said. “Instead of providing money to low-income kids, or first-generation kids, (such programs) are giving it to those who need it least,” Schaeffer said. The National Merit awards have been handed out during an era when college tuition has risen steeply, although studies show tuition and fees are more affordable in Oklahoma than in many other states. State funding for higher education has declined but remained flat this year. OU did not raise tuition. With new president Gallogly, a businessman who has focused early on tightening the university’s belt, it’s unclear whether the National Merit Scholars program will return to being the showcase it was.